Hi there. I'm back today to share some gift sacks I made using the Rose Gold Craft Kit from my shop. The kit is now sold out so thank you to all who ordered a kit or two. Remember, if you ordered some Gossamer Blue Gramercy Road items, the kit items coordinate wonderfully. If you're interested in something similar you can check out my Indian Summer Paperclip Flags Kit. You can also find the Large White Sacks and XL Manila Parcel Tags sold separately. I saved back some kit items for myself and here's a few gift sacks I created. 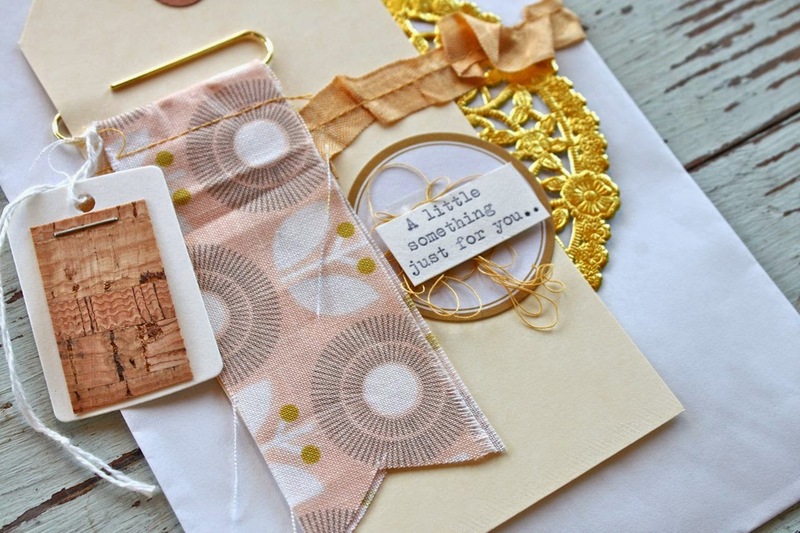 Lots of fun layering and lots of fun little pretties....which makes the gift sack just as special as the gift tucked inside. I use these for packaging up a few cards, a notebook, flat candy bars and treats, fat quarters and crafty supplies, etc. Several of you have asked what you do with the fabric clips. I created these extra long so you can use them as is, notch the bottoms like I did on my projects today, trim them down, cut an an angle, etc. 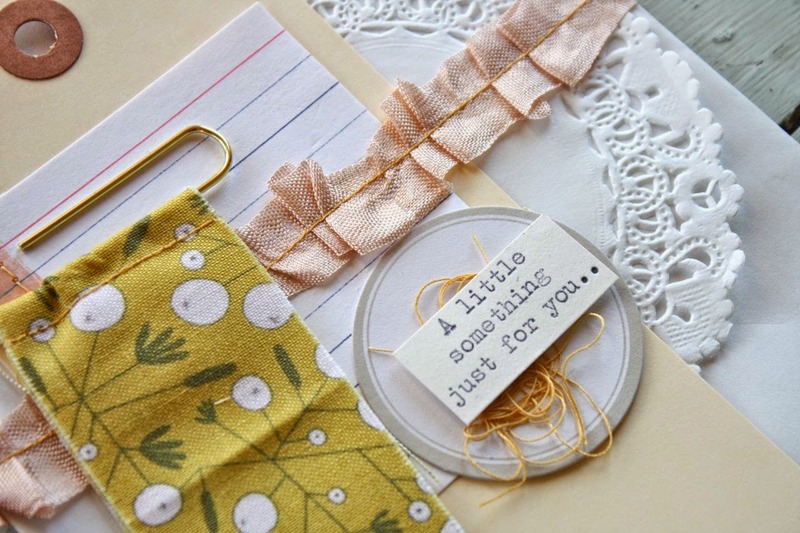 You get an old clothespin wrapped with lots of pretty seam binding. I used this peach color below and ran it through my sewing machine with gold thread. By just fold the ribbon over and over you create little messy pleats. I put double sided tape on the back and just tucked the raw edges to the back of the sack. For the little sentiments, I used my vintage typewriter to type out just what I wanted. 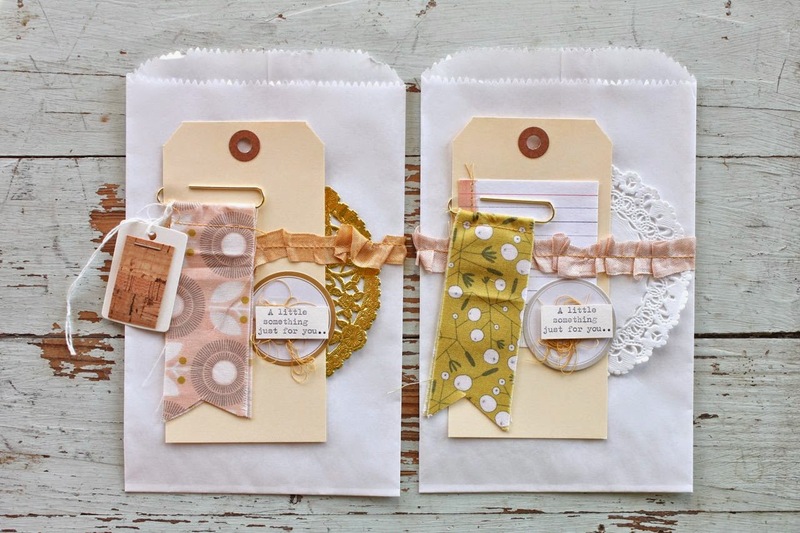 The key to making gift sacks with lots of embellishments is to just layer and tuck little items here and there. I like to use flat items paired with dimensional items to create interest. That's why you get so many little goodies in my kits, I just love creating them. Hope you enjoy and thank you for stopping by! another super cute creation of yours!!!! I love how you added the fabric with the clip attached to it!!! Holiday shop is open today..